The holiday season has officially landed in Stanley Park! 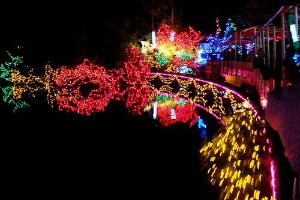 Now in its 15th year, Bright Nights in Stanley Park (November 29 to January 1; closed on Christmas Day) transforms the forest into a dazzling light display complete with music, entertainment and over 2 million twinkling lights. Ride the train, watch animated displays, listen to holiday classics, munch on sweet snacks and meet Santa in his workshop! But best of all, donations collected at the event and partial proceeds from the train tickets go to the BC Professional Fire Fighters’ Burn Fund. Last year the event raised $270,000, and with more than 100,000 visitors expected this year, the event is expected to raise more than $275,000. Entry to the plaza is by donation (you don’t have to ride the train to see the lights) and train tickets are $10 for adults, $7 for children/youth/seniors and free for children ages 3 and under. Bright Nights in Stanley Park has long been a special attraction for visitors of our Vancouver bed and breakfast and a beloved holiday tradition for many families in the Lower Mainland. It’s an extremely popular event, so make sure to buy your train tickets in advance! On site, at the Miniature Train ticket booth, starting at noon every day. 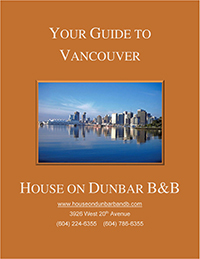 Stanley Park is only 20 minutes from House on Dunbar B&B. We’d be more than happy to arrange tickets and the best mode of transportation!